I did it - I really did it! Proof - My first ever Half Marathon medal which I shall keep with pride. Wk 7: Where has the time gone? Wk9: I see the route and think... what? 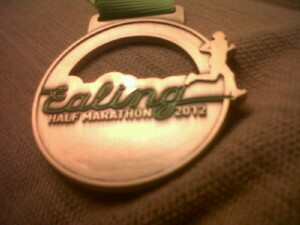 I completed the Ealing Half Marathon. Wow. That feels rather impressive. Please allow me to wallow in a bit of glory for a short moment. It was done against all the odds. I'm not a runner, and, although I attempted to become one, my foot injury stopped me from training a couple of months back. So I really wasn't in the best shape to take on 13.1 miles in any form. But I said I would do it, and even when my race pack didn't appear and I took it as another omen that perhaps I shouldn't take part this year, I still did. Why? Well, I like a challenge and there is nothing like a half-marathon to challenge you. I never knew Ealing was quite so hilly though, and although I wasn't exactly running the route it was still very, very tough. I had some wobbly moments. My legs turned to jelly at about 5 miles in and it took every last ounce of positivity to keep me moving. At one point I had a police van behind me trying to get me to move along a bit faster because the roads were due to reopen. I was so tempted to ask for a lift back, but I didn't. The people who cheered us along and the marshalls have to be thanked for doing a brilliant job, it certainly helped me in my plight. The best moment for me was when the magic marker of 10 miles appeared. Ok I may have already been overtaken by a runner on his second lap (which I didn't realise at the time) but for me it was still a momentous achievement. Double figures felt so much better than single - and it meant I was closer to the end. I had a surge of energy (possibly due to the vast quantities of glucose tablets I had been taking!) and when the U2 track 'Beautiful Day' came on once more and I began to jog just for a little longer. The last few miles between Walpole and Lammas Parks were exhausting, and having to loop around rather than just cut across was torture. Walking can be just as tough as running. It takes a lot of inner strength to get you through when you just feel like sitting down on the nearest bench and giving up. But I didn't, I couldn't. I had come so far and approaching the finish line and seeing my family waiting was enough to give me the final push. I made it and got back way before midnight too. What on earth am I saying? I'm the RELUCTANT Runner, why on earth would I want to do it again? Congratulations to the organisers and everyone who ran in Ealing's inaugural Half Marathon - I feel privileged to have been a part of it.